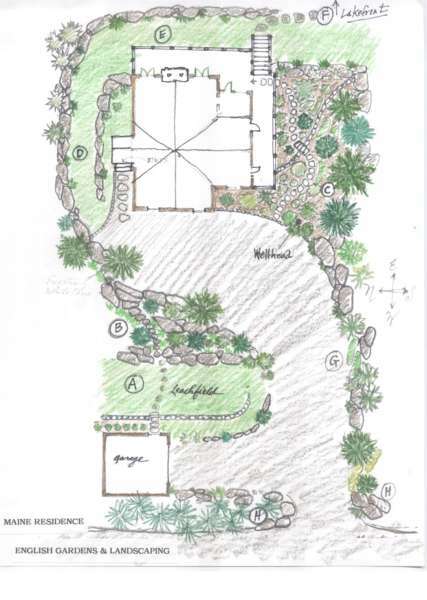 Project Brief: Provide a low-maintenance landscape plan for this lakeside summer residence. Must adhere to strict Dept. of Environmental Protection guidelines. Must address extreme grading issues while providing safe and comfortable access to lake and woodland buffer zone. Must provide "green screen" from adjoining properties. Must incorporate numerous massive boulders unearthed during site excavation. Must allow for vehicular access to front of cottage. View completed 1st stage of Project here.